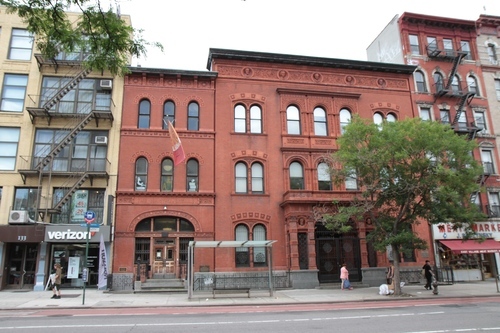 The German Dispensary, together with the adjoining Ottendorfer Public Library, in New York (135 and 137 2nd Avenue) "were built in 1883-84 and were designed as a pair by German-born architect William Schickel. 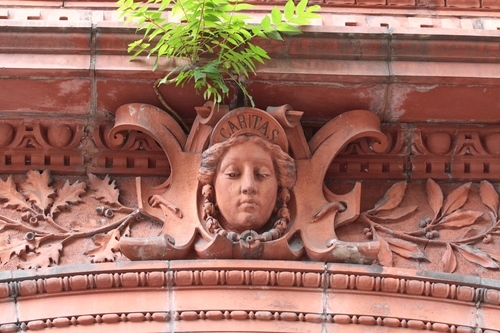 They were designed in the neo-Italian Renaissance style, with Philadelphia pressed brick facades ornamented in terra cotta, a relatively new building material to New York. 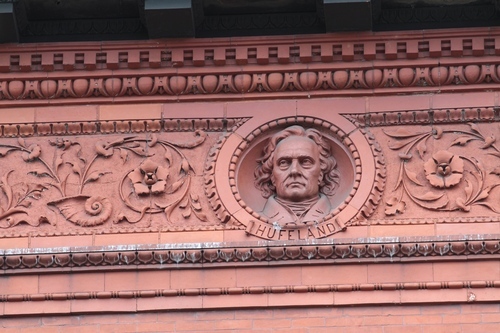 The buildings were a gift to the City of New York by philanthropists Oswald Ottendorfer, a German immigrant and publisher of the Staats-Zeitung, the city's largest German-language newspaper, and his wife Anna Ottendorfer. 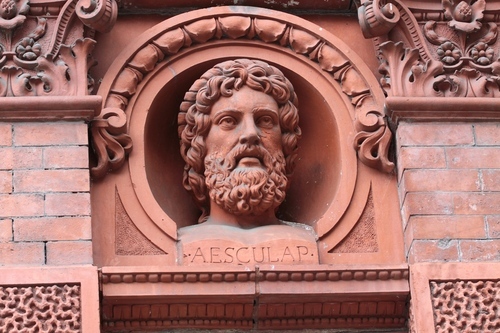 (…) The Stuyvesant Clinic was originally known as the "German Dispensary", and was affiliated with the German Hospital uptown, now Lenox Hill Hospital. 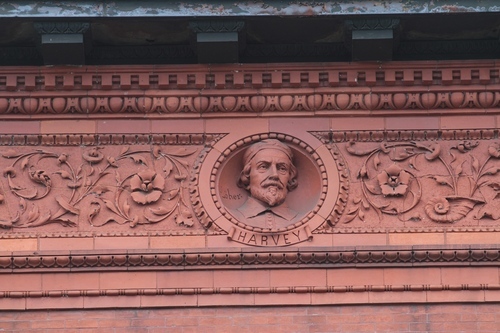 It provided free medical care to German immigrants on the Lower East Side on the model of the Northern Dispensary in Greenwich Village. 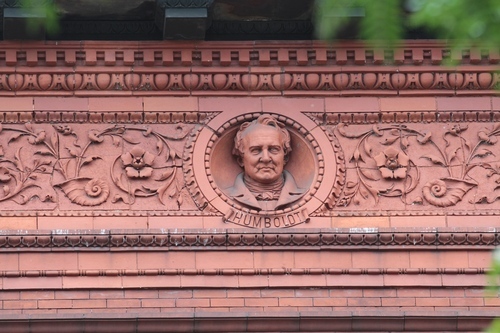 In 1905, the German Hospital began plans to build a dispensary uptown, closer to the hospital, and better located to serve the growing German population of Yorkville. 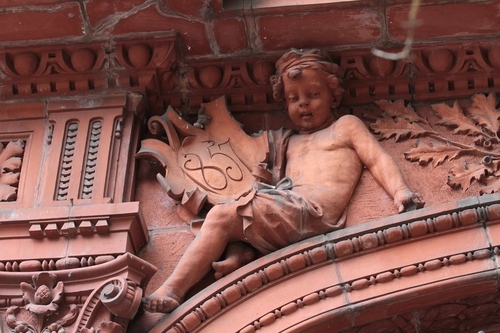 It sold the building in 1906 to another medical charity, the German Polyklinik. 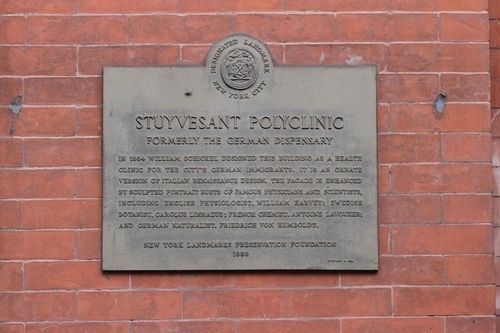 This name was changed to "Stuyvesant Polyclinic" due to the anti-German sentiment connected with the entrance of the United States into World War I. 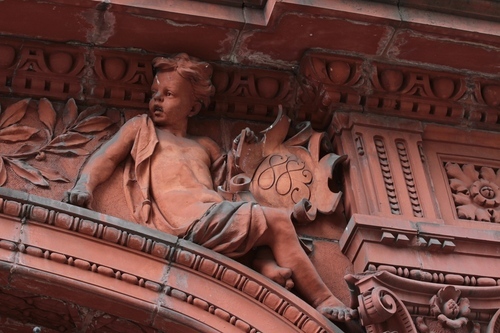 (…) The building was restored in 2009 by David Mayerfied. 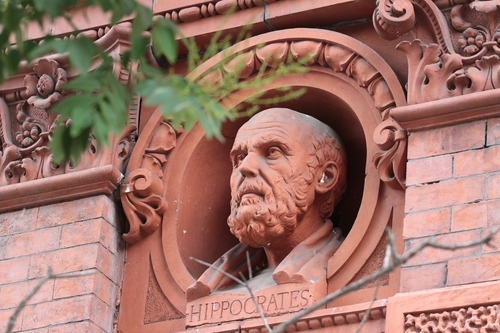 The Stuyvesant Polyclinic building was designated a New York City landmark in 1976"1. 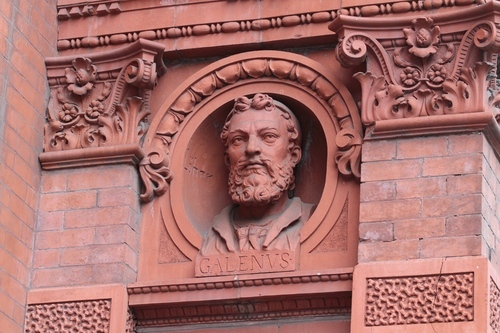 Four busts , portraying figures from Classical Antiquity adorn the porch: Celsius2, Roman author of medical texts; Hippocrates, Greek physician; Asklepius, Greek god of medicine; Galen, Greek physician and writer of the Roman period. 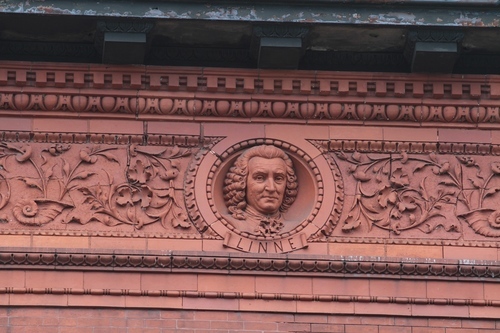 Whitin the elaborate foliate frieze beneath the cornice of the building are five additional busts depicting men of the 17th, 18th and 19th centuries: Harvey, English physiologist and court physician; Linne, Swedish botanist; Humboldt, German scientist and explorer; Lavoisier, French chemist and physicist; Hufeland, German physician and author"3. 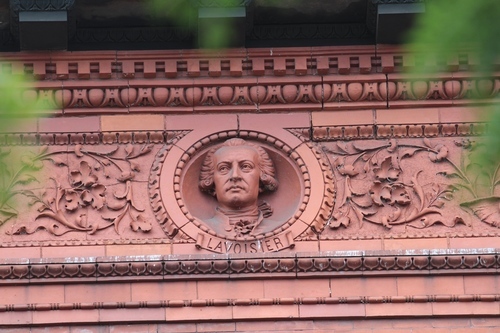 In the niches of some of the beautiful terra cotta heads we can read the name of the sculptor: Löher (probably German-born American sculptor Aloys Loeher (1850-1904)4. 2. 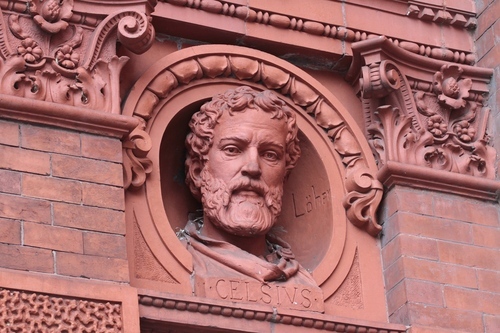 A misspelling for Celsus. 3. 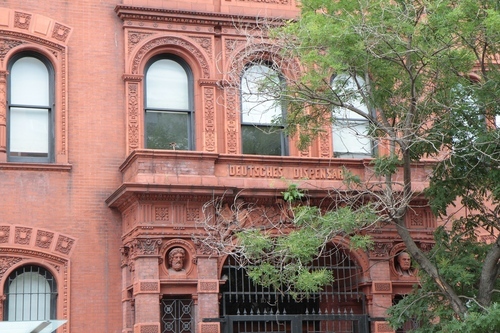 See [http://www.neighborhoodpreservationcenter.org/db/bb_files/STUY-POLYCLINIC.pdf Stuyvesant Polyclinic Hospital (1976).